One of the most bizzare suggestions is to use pellets as bedding. The same stuff that goes into their hopper or bowl is supposed to be their bedding too. Firstly this is a waste of money 'cos food pellets are not cheap. Secondly I feel its a crime to waste food like that. Food is meant for eating & nothing else! Not only that but certain pellets (like Kaytee) smell sweet & may contain sugar. And what about pellets that are more oily than others (like Hartz)? Imagine your cavy sitting on bedding that is oily or sugary. How disgusting! Not all cavies are born equal. While some are very intelligent, others can be rather simple minded & can get confused easily. Give it food pellets as a bedding & it may think the food bowl or hopper is also the place to poop & pee. 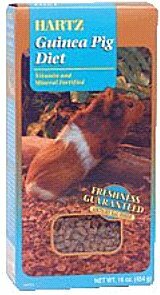 You also wouldn't want your cavies eating moist & mouldy pellets that you used as bedding! Cavy may get ill from eating dirty / mouldy pellets. Cavy may get dirty from lying on something meant for eating.